Test Points are color-coded to facilitate identification. PCB-mountable, RoHS-compliant TP-104 Series are through-hole parts engineered for use on 0.062 in. thick boards. Suited for high-density PCB fabricators, products can be ordered precut to any of 30 positions and feature loop-style test points' plastic standoffs that facilitate polarization. Rectangular passage in molded standoff maintains wire form alignment. Low-profile series facilitates secure, non-slip grip of alligator clips, probes, J-hooks, tips, and grabbers. Denville, NJ, December 13, 2006...Announced today from Components Corporation, a world leader in the design and manufacture of printed circuit board hardware technology, is the 100% RoHS-compliant TP-104 Series of color-coded PCB mountable test points. The loop-style test points' plastic standoffs permit quick and straightforward identification, and allow easy polarization. Targeted to fabricators of high-density PCBs, these through-hole parts are engineered for use on 0.062" thick boards in a wide range of such applications as consumer, medical and aerospace. The low-profile Series is specifically designed to facilitate a secure, non-slip grip of alligator clips, probes, J-hooks, tips and grabbers. Moreover, their employment eliminates the risk of skin punctures often resulting from the use of turret terminals and wire-wrap posts. TP-104s may be ordered precut to any of 30 positions and are offered on breakaway strips with 0.125" centers to make storage, and handling convenient. Additionally, devices are easy to install individually as well as and in tandem, especially with Component Corporation's distinctive hand tool (P/N 1040). The tool promotes robust and reliable PCB mounting as it functions to separate, grip and position the test points in a single, effortless motion. To further protect the integrity of tandem installations, parts feature a rectangular passage in their molded standoff to maintain wire form alignment. Once accurately positioned on the board, terminals will remain securely in place during and after the wave soldering process. Ensuring the highest standards in performance, components are manufactured of 0.015" x 0.030" phosphor bronze #510 alloy and a 100% matte tin (0.0001 min.) over nickel (0.00005) underplate. 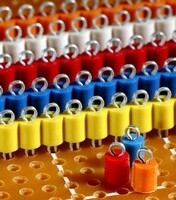 Their plastic bases are UL 94V-0 rated, and offered in 10 colors including red, white, black, orange, and yellow. Collar is 15% glass-filled polyester. For additional information, visit http://componentscorp.com/details/tp104.html. Pricing for Components Corporation's TP-104 Series of color-coded PCB mountable test points is $0.092 each in quantities of 1,000. Delivery is from stock to 4 weeks. Samples are available upon request. For over 60 years, Denville, NJ-headquartered Components Corp. (www.componentscorp.com) has been a global leader is the design, engineering and manufacturing of precision printed circuit card edge connector, printed circuit test points, preform jumpers and hardware, and battery contacts. The Company remains committed to solving the industry's most demanding interconnect and testing challenges with high quality and innovative products for the broadest range of mission-critical applications. Its leading industrial, military, commercial and consumer customer base have come to rely on Component Corporation's in-house tooling capability to ensure the excellence and economy of products regardless of the quantity required. The Company's products are marketed through a worldwide network of sales representatives and distributors (http://componentscorp.com/html/search.asp. ).